Improving candidate experience is a must if you want to win in a war for talent. The current job market is candidate-driven, which means you don’t pick talent anymore. Talent picks you. That’s why it is absolutely necessary for your company to start improving candidate experience right now. Read on and learn how to attract and recruit top talent in 10 simple steps! Candidate experience is more than just another passing HR trend. The way we recruit has changed. Current job market is candidate driven. That means you don’t pick talent anymore. Talent picks you, and they do it based on their candidate experience. That’s why it is absolutely necessary for your company to ace candidate experience. You’ve probably heard a lot about the term “Candidate experience”. It’s one of the most important HR buzzwords in a modern recruiting and hottest topic in recruitment marketing. The term “candidate experience” refers to candidate’s experience in the recruiting process. By (short) definition, “candidate experience” is candidate’s overall perception of company’s recruiting process. It sounds pretty simple, right? Yes, at first. But it’s actually a very complex notion. What does “candidate experience” really mean? How to improve it? How to measure it? “Candidate experience” is candidate’s overall perception of company’s recruiting process. 1. Who is “candidate” in this definition? The term “candidate” encompasses not only current job seekers but also all the past candidates and potential future candidates. 2. What does “overall perception” mean? “Overall perception” incorporates all the feelings, behaviors and attitudes candidates experience during the recruiting process. Here is a scenario! Candidates submit applications to for job openings and receive confirmation emails. One, two weeks pass, and there is still no response from your company. Candidate feels frustrated and flustered, and then they act on it. They may complain to their family, friends or even colleagues. They may even write an angry review of your company’s Glassdoor profile. Either way, their attitude towards your company and employer brand is now negative. 3. Why the emphasis on recruiting as a “process”? Recruiting is a process - it includes different phases such as sourcing, screening, interviewing, hiring and onboarding. Every interaction a candidate has with your company at any of those phases affects their candidate experience. That means you must provide an exceptional experience at each of these phases. “Candidate experience” is current, past and potential future candidates’ overall perception of your company’s recruiting process. It is the product of candidates’ feelings, behaviors and attitudes they experience during the whole recruiting process, from sourcing and screening to interviewing, hiring and finally onboarding. According to Matt Charney, executive editor of Recruiting Daily and a key influencer in recruiting, candidate experience is more than another buzzword. It’s not just a trendy new hiring fad. It is something that happens every single time you recruit, whether you pay attention to it or not. And it has very serious consequences! A negative candidate experience can have a disastrous effect on your recruiting process AND on your company’s overall success. According to different research (Harris Interactive 2013, CareerBuilder Survey, 2015, 2014, 2015 and 2016 CandE Reports etc. ), companies who fail to deliver a quality candidate experience may likely suffer some serious consequences. 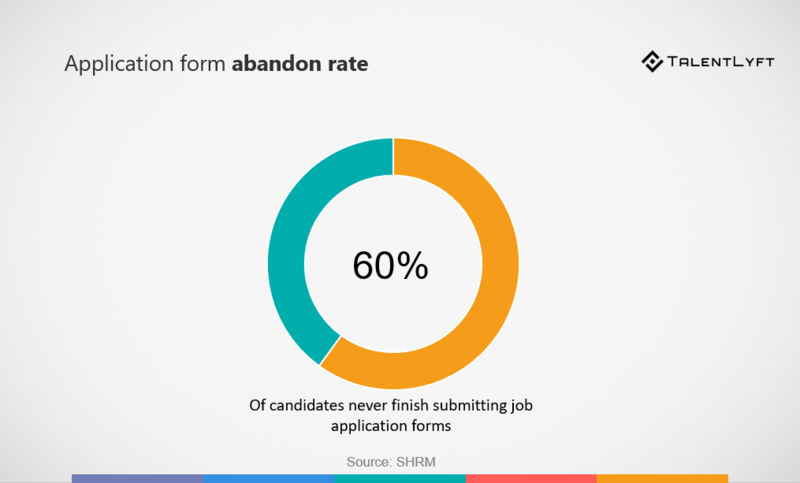 Your unhappy candidates are more likely to reject your job offering, never again reapply for your job openings and encourage others not to apply, thus wrecking your hiring process. But a negative candidate experience can cost you more than a few candidates - it can even lose your company big bucks! Unhappy candidates are also more likely to boycott your company’s products and even tell others not to purchase your products or services. The most famous example of this is the case of Virgin Media, a company who calculated that a bad candidate experience costs them a shocking $5.4 million annually! Finally, according to CareerArc’s research, 72% of candidates who had a bad experience told others about it, either in person or online. In today’s world of social media, are you really willing to take that risk? A positive candidate experience, on the other hand, leads to enormous long-term benefit for your company, regardless if the candidate was actually hired! According to different research and studies (CareerBuilder Survey, 2013, 2014, 2015 and 2016 CandE Reports etc. ), candidates who had a positive candidate experience in your recruiting process will more likely accept your job offer, reapply in future and refer others to your company, which means you will grow your talent pool and improve your employer brand. Consequently, you will have more applicants, more hires and higher quality of hires, with reduced cost per hire and time to fill. Additionally, you could also benefit by turning your candidates (even the ones you rejected!) into your brand ambassadors who will advertise your company and your business for free by the word of mouth and on social media. According to the 2016 Talent Board North American Candidate Experience Research Report, 81% of candidates will share a positive experience with family, friends, and peers, and 51% will share their positive experience on social media sites like Glassdoor or LinkedIn. As we already explained, “Candidate experience” is current, past and potential future candidates’ overall perception of your company’s whole recruiting process, from sourcing and screening to interviewing, hiring and finally onboarding. Every interaction a candidate has with your company at any of those phases constitutes a so-called touch point. Did you know that even before a candidate enters their first interview, most have already had as many as 50+ touch points with your company? To deliver that perfect candidate experience, you should start with your candidate persona and carefully craft your candidate journey by paying attention to each and every touch point. It might seem a bit overwhelming at first, but if you really want to stand out among other employers and reap all the benefits an awesome candidate experience can provide, it should definitely be your long-term goal. For starters, let’s focus on the most crucial touch points that can make or break your candidate experience. Based on exhaustive research by different authors (The Candidate Experience Study by Kelly Services, 2014, Candidate Experience Study by Future Workplace and CareerArc, 2016, Global Talent Trends by LinkedIn, 2015, Inside the Mind of Today’s Candidate by LinkedIn, 2017), we bring you the most important touch points that you simply must improve if you want to deliver a positive candidate experience. We structured them into 10 easy to follow steps for improving the candidate experience. A recent Talent Board report found that job descriptions are the most important job-related content that candidates look for when researching a job. So what are they looking for? What makes job seekers want to apply? They want a clear and accurate explanation of the job and responsibilities, not a laundry list of your requirements. They also want to know about the salary range, perks and benefits and company values. And they want all the information in an easy to read format. PRO TIP: Writing a job description that attracts candidates is the very first step in finding, attracting and hiring the right candidate. To help you save time, we have created free most common job descriptions templates and samples, ready to use and post to multiple job boards with just one click. Setting expectations about the recruitment process is very important in delivering a positive candidate experience. According to research, 83% of candidates say it would greatly improve their overall experience if employers could set expectations about the recruiting process. Knowing what they’re up for can ease candidates’ self-doubt, nervousness and confusion. They will feel less stressed and more valued by your company. PRO TIP: It is crucial for you to make clear what exactly your hiring process will look like. Did you state clearly the steps of the application process? How long will each step take? Is there someone they can ask about it? Offer resources and tips to help candidates. A great example is Google’s How We Hire, a transparent and detailed look into their recruiting process. According to research, 89% of job seekers, your career site is the most visited recruiting asset you have, so ensuring candidates can easily find the information they need is essential to a great experience. After hearing about the job, they don’t apply right away. Instead, they look up your company’s website. Use that chance to turn your career site into a one-stop shop that provides answers to all the questions candidate may have. Make sure you deliver useful, relevant and informational content to the candidates. PRO TIP: Your career page is the best representation of your company and a great place to showcase your company's employee value propositions and use all of your employer branding ideas. 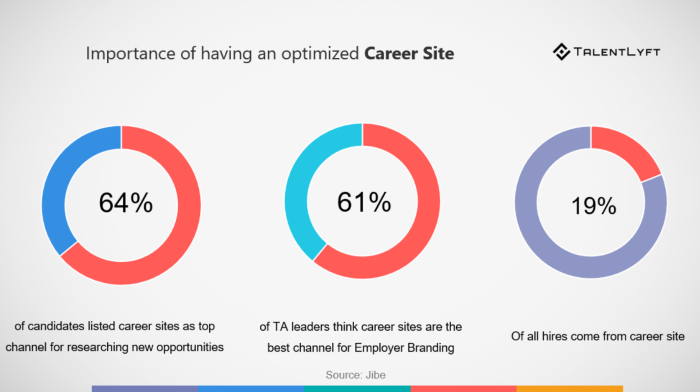 There are many things you can do to improve and optimize your career site. We prepared a detailed step by step guide to help you get more job applicants from your career site. Research shows that the typical candidate spends about 3 to 4 hours preparing and submitting one job application. It’s hardly surprising then, that 60 percent of job seekers quit in the middle of filling out online job applications because of their length or complexity. This is especially true of A-players and passive candidates who are somewhat interested but not really sure they want to change jobs. A lengthy application convinces them it is not worth the effort. Also, lengthy application processes make the candidates experience much poorer. PRO TIP: Have you ever really looked at what you are asking of job seekers? Test your own application process. How easy is for candidates to apply? Is your job application too long? Is your application form complicated? Is it possible to apply from all devices? Evaluate your application process and do everything you can to make it shorter in time and more simple. Consider asking only what you really need from people at this first point of contact. Candidates want the hiring process to be brief and they want timely communication from employer’s side. When candidates choose to apply for your job opening, they are spending time researching, preparing their resume, applying, interviewing and traveling. According to LinkedIn’s survey, it generally takes 2 to 3 months for candidates to move from application to hire. This is quite problematic because top talent stays on market only for 10 days. In today’s candidate-driven job market candidates have a lot of opportunities, especially those with in-demand skills. The more time you take, the more competitive offers they’ll see. PRO TIP: A candidate is more likely to take the first of two equal offers because the risk of losing both feels worse than the benefit of getting both. A job offer now is worth two in the future, so don’t wait to respond. What constitutes a timely response by employers? This a recurring theme in the recruitment experience. Most of the candidates say that 3 to 5 business days is an acceptable time frame. Research shows that the No.1 frustration during the overall job search is the lack of response from employers. Also, an overwhelming 81% of candidates that the one main thing that would greatly improve their overall candidate experience is employers continuously communicating status updates to them. Candidates hate to be left out in the dark, so make sure to communicate with your candidates regularly and on time. PRO TIP: Create email campaigns that will keep your candidates interested and engaged. Set up personalized campaigns based on different stages of recruiting and hiring process. With our TalentLfyt Engage, you can create your own email templates, or use existing ones to save time. The interview is a pivotal point in the candidate's’ job search journey. Getting the interview right will win you top talent while getting it wrong can hurt your recruiting efforts. No matter how well you pitch a job, nearly all professionals are still unsure about the job and company when they show up for the interview. According to LinkedIn research, 83% of talent say a negative interview experience can change their mind about a role or company they once liked. On the flip side, 87% of talent say a positive interview experience can change their mind about a role or company they once doubted. PRO TIP: Ask great interview questions, keep your interview period short and offer candidates a chance to learn about the role and your company culture. A great way to that is to show off your workplace. Invite candidates to office tours, open houses and/or lunches. You can even make it a part of your interview experience - simply walk around your workspace after interviews and give candidates a glimpse into your culture. Having leadership meet with candidates and following up promptly with feedback will further boost their interview experience. Feedback helps candidates improve as professionals, and they are very well aware of that. According to LinkedIn hiring statistics, 94% of talent wants to receive interview feedback. According to another LinkedIn survey, 77% of professionals said they prefer to receive good news over the phone. But if you have to deliver a bad news, stick to emails, because 65% of professionals would prefer to read rather than hear that they didn’t make the cut. PRO TIP: Make sure to provide feedback for candidates that you didn’t hire. If the feedback you offer to rejected candidates is constructive, they will be 4 times more likely to consider your company for a future opportunity. Remember that a recruiting is a two-way process. Don’t just give feedback - ask for it too! The insights you get can be invaluable for improving your candidate experience. Despite popular belief, a candidate’s experience doesn’t end when you decide not to hire them. Candidates that don’t make the cut for this position may be a perfect fit for some other future job openings. Keeping in touch and engaging with high-quality candidates can significantly reduce recruiting and hiring cycles. That is why candidate relationship management has become one of the most important HR metrics for measuring the success of recruitment marketing. Imagine having a perfect job candidate every time when a new position opens! Build your talent pool for future roles and job openings. Once a need arises, use your talent acquisition goldmine to search for perfect-match candidates. PRO TIP: So how can you keep your silver medalists interested and engaged? Let them know that you thought they were a great candidate and acknowledge that you want to keep in touch. Forge a professional relationship and connect on LinkedIn and your social media profiles. Add them to your recruiting email campaigns. Organize talent networking events and invite candidates from your talent pool. Inbound Recruiting is a recruiting strategy where you proactively and continually attract candidates with the goal to make them choose you as their next employer. By taking an inbound marketing approach to recruiting, companies can connect with passive and active job seekers and delight candidates throughout the application process. Inbound recruiting creates a remarkable candidate experience through employer branding content and helps companies build relationships with top talent. PRO TIP: Use recruitment content to provide useful and relevant information about your company and showcase your Employer Brand on various online and offline channels that candidates use. Create appealing employee testimonials and stories, shoot attractive company videos and provide interview and career advancement tips to get potential candidates interested in working at your company. Measuring and analyzing your current candidate experience is a first step in improving it. In order to gain insights on which parts of your candidate experience journey work well, and which ones have room for improvement, you need to get feedback from your candidates. Send a candidate feedback survey to all the candidates when they exit the recruitment process, whether they were declined, opted out, or were hired. The survey can ask both closed-ended and open-ended questions to measure the experience and pinpoint problems and potential improvements. Social media tracking of what is being said about your company on the internet can also be used to track candidate experience. PRO TIP: Our TalentLyft Analytics is designed to measure the most important recruiting metrics. Make, run, export and share beautiful reports with most important candidate experience metrics such as Career site conversion rate, Application form abandon rate, Email response rates, Time to hire, Hires per sources, Offer acceptance rate, etc. Take your candidate experience journey to a whole new level! Our TalentLyft recruiting software offers easy to use Recruitment Marketing and Applicant Tracking System tool to help you find, attract and hire best candidates. TalentLyft Source solution helps you find and reach best candidates, TalentLyft Engage makes it easy to build relationships with them and TalentLyft Convert encourages them to apply. Finally, TalentLyft Track offers the possibility to monitor the whole candidate experience in one place and provides invaluable candidate experience metrics and reports.